LaCie, Seagate's premium brand, today announced the launch of the new LaCie Portable SSD, a palm-sized storage device with up to 2TB of storage space. 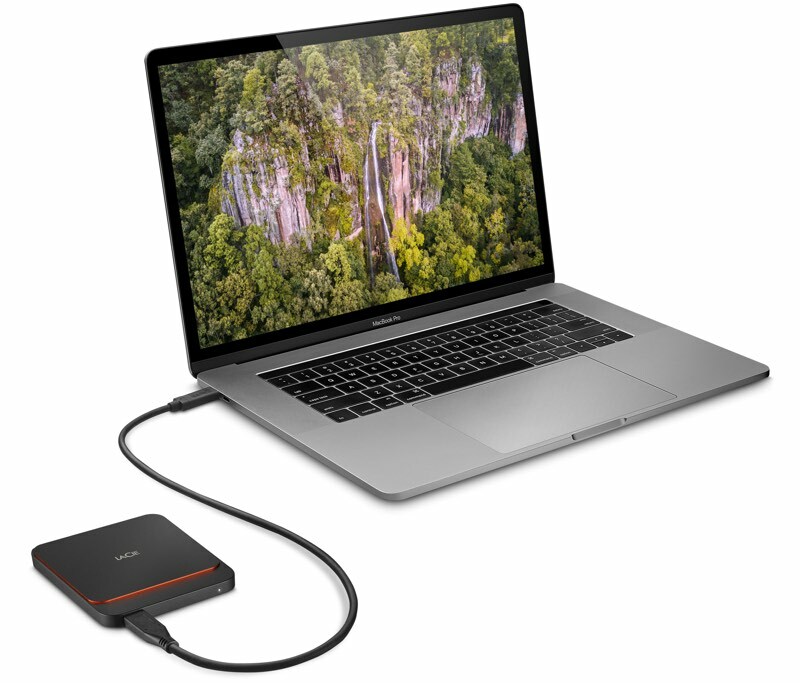 The new Portable SSD is one of LaCie's smallest and lightest SSD options, with the 1TB model measuring in at about three and a half inches long and just under three inches wide. It's pocketable at about 1/4 of an inch thick, and it easily fits into a bag or backpack without taking up much space. LaCie says this drive is suitable for on-the-go use with drop resistance of up to two meters. We dropped it a few times from a two-meter height onto wood flooring to test LaCie's claim, and the SSD suffered no harm. The SSD is made from a black plastic material with a red-rimmed black metal plate at the top that catches the light and looks quite attractive. There's unobtrusive LaCie branding at the top of the drive and a white LED at the front that comes on when it's plugged into a computer. The LED is a bit too bright in a dimmer room, but it's not a dealbreaker. LaCie offers the Portable SSD drive in 500GB, 1TB, and 2TB capacities, so there are a total of three models at three price points. 500GB of storage costs $125, 1TB of storage costs $270, and 2TB of storage costs $540. 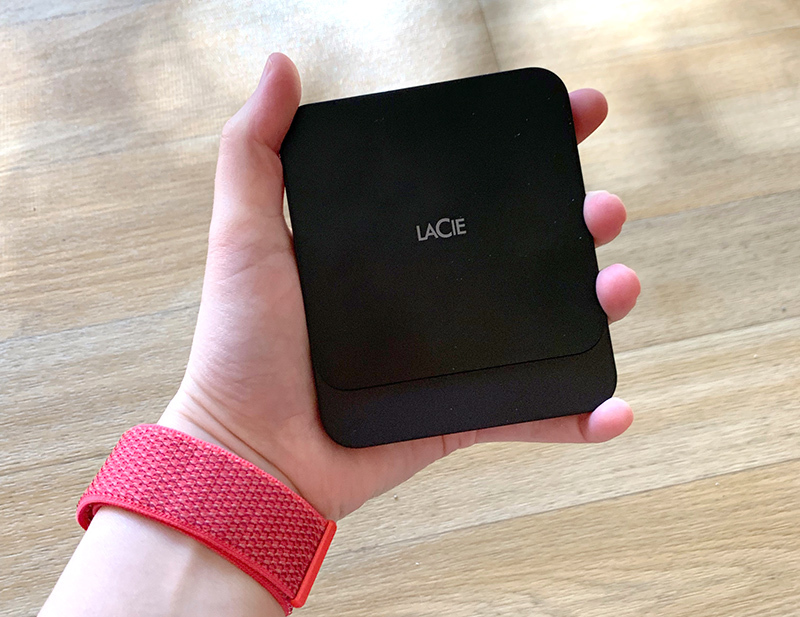 LaCie says that the Portable SSD features USB 3.1 Gen 2 with maximum read/write speeds up to 540/500MB/s, which wasn't too far off of the speeds that we saw in our testing of the 1TB review unit that LaCie sent for evaluation ahead of the product's launch. 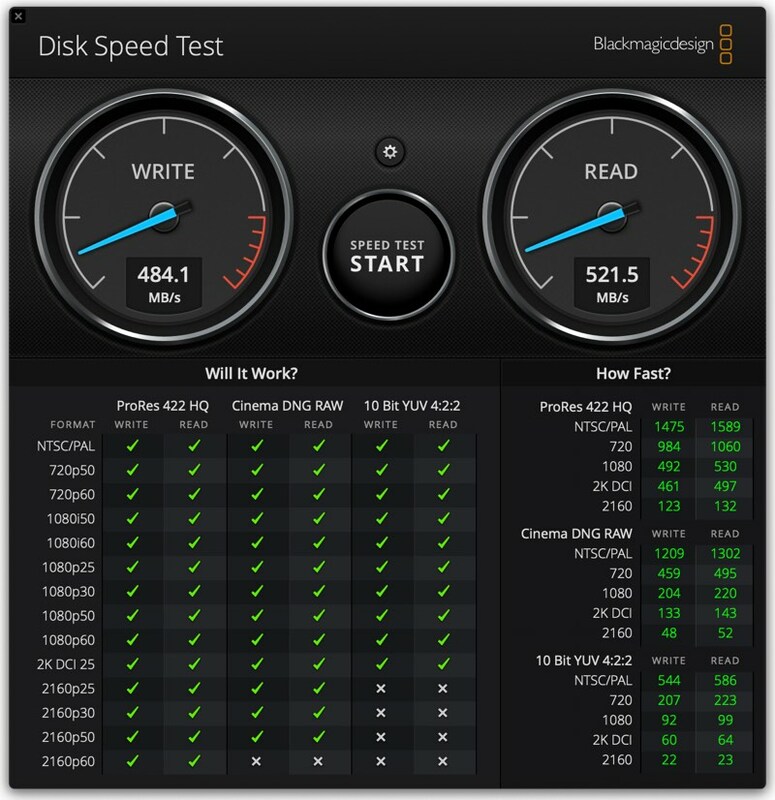 Using a Blackmagic Disk Speed Test with a 2016 MacBook Pro, read speeds for us maxed out at about 524MB/s, while write speeds maxed out at 485MB/s. We didn't quite see LaCie's maximum speeds with the 1TB model, but it was still quick. Transferring 45GB of photos from the MacBook Pro to the LaCie drive took just about four minutes, and LaCie says that you can transfer one hour of 4K 30fps footage (aka 30GBs) to the drive in about a minute. We didn't see transfer speeds quite that fast, but on the 1TB model, but it wasn't far off. Transfer speeds will, of course, differ based on what other peripherals you might have plugged into your Mac and your Mac's overall workload. During testing, the Portable SSD stayed cool, getting only the slightest bit warm when transferring a large number of files. 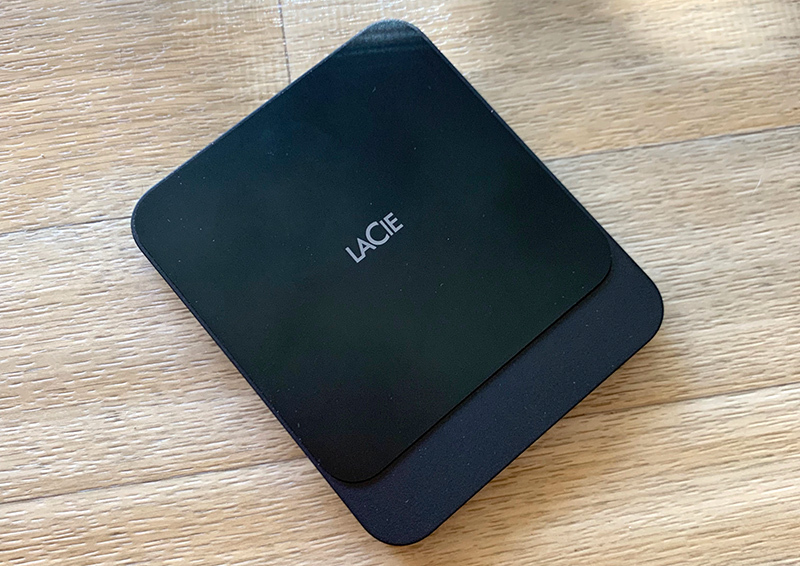 LaCie ships the Portable SSD with both a USB-C to USB-C cable for connecting USB-C accessories to one of Apple's Macs with a USB-C port and a USB-C to USB-A port to connect it a Mac with a USB-A port, so it's compatible with both. You won't get USB 3.1 Gen 2 speeds with a USB-A port though, so be aware of that. The drive comes formatted in exFAT, so it is compatible with both Mac and Windows machines, but it can be reformatted using the Disk Utility feature in macOS. 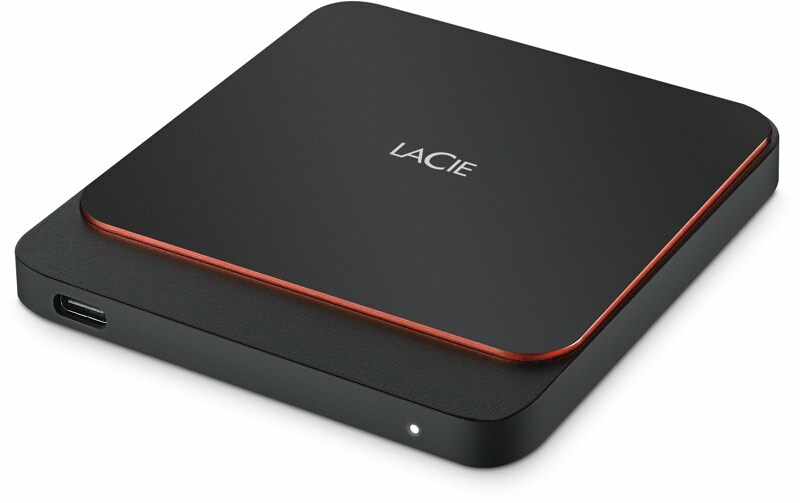 It comes equipped with a link for registration and to download the LaCie Toolkit software for managing the device. LaCie's software is designed to sync files between mirrored folders on your computer and the Portable SSD and it is not required. LaCie's drive features a three-year warranty and a three-year Seagate Rescue Data Recovery Plan that offers data recovery should the drive fail. If you need ultraportable storage for uploading and saving content while on the go, LaCie's new Portable SSD is worth checking out thanks to its small size, durability, and fast transfer speeds. It is pricier than some other options that you might find on Amazon, but it does come with a three-year warranty, which is worth taking into account. The LaCie Portable SSD can be purchased starting this month from third-party resellers like Best Buy, Adorama, B&H Photo, and more. 500GB of storage is available for $125, 1TB of storage is available for $270, and 2TB of storage is available for $540. Note: LaCie provided MacRumors with a 1TB Portable SSD for the purpose of this review. No other compensation was received. Get yourself any regular 2TB SSD from Samsung, Sandisk or WD for roughly $350 and slap it inside a $10 USB 3.0 enclosure and you've got the same product. How do these stack up against the Samsung T5? These appear to be a larger form factor but a direct competitor of a widely used and respected product. Sorry, but if you are going to take the time to write this up, a note about a comparison to that product is not only warranted but really imperative. Hard to justify a $580 LaCie over a $400 Samsung T5 of the same speed. Ha! I bought a Sandisk Extreme 2TB external SSD on sale at Amazon for $339 last week. I boot Mojave from the drive. It's less than half the size of that LaCie. LaCie drives are GARBAGE. Highest rate of failure on the entire market. Don't buy one unless you like throwing money away on data recovery (and with current tech it's very unlikely). Maybe this form factor is to better dissipate the heat. I read somewhere that T5 had some heat issues. By the way, I assume this are not Thunderbolt 3 drives, just USB 3.1 gen2, right? No issues with T3/T5 drives. I use them to clone and large file back ups. Yes there is no need for TB3 on these drives. They are SATA3 in a USB enclosure. Yes, I have had so many LaCie failures in the last 15 years. How do these stack up against the Samsung T5? Looks like the same speed but physically 2.5 times larger. No thanks. LaCie does not manufacture the drives that are inside its LaCie-branded enclosures. They are generally Seagate drives. It seems to be a much cheaper storage option than Apples internal offer.